Last time I went on holiday I packed way to many clothes, my already large suitcase was fit to bursting. Not only was this heavy and cumbersome, but a nuisance to the other passengers we were travelling with. Next time I go away I will be attempting to pack light. Taking only essentials and planning more thoroughly. Packing effectively requires careful planning and practicality. Smart minimalist packers are the smuggest looking trotting down the airport terminal walkways with the well oiled, stable and compact wheeled suitcases. While you struggle on behind with your lofty, poorly balanced suitcase that is constantly falling over every small bump it hits. Heavy luggage is not only bad for your back, but you could find yourself with a hefty excess luggage charge from your air carrier. You could have avoided all this by proper planning and organisation. If you are planning a short break in the near future, you should really invest in some good luggage. It really does make a massive difference having a good quality bag with handy storage compartments for all your travel paraphernalia. I spent ages looking for suitcases visiting many sites and eventually purchasing one from Luggage Express. But before you decide on a suitcase, check with your airliners carry on restrictions, most domestic carriers allow you to take on a suitcase up to 45 linear inches in size, but others such as Ryanair have much stricter guidelines. One of the best pieces of advice I can impart with you to help you pack lighter is to make a checklist. Checklists really help you objectify what is actually necessary and what isn’t. Write down exactly how many pieces of each clothing you will need for the entirety of the trip. Always remember, when laundry is available at your destination, much less luggage will be required. 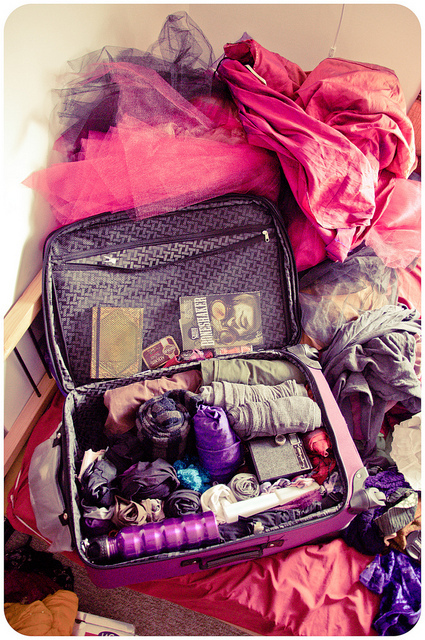 When packing your bag, refer too your checklist to avoid packing excess items. Another essential piece of advice is to always pack ahead of time. It may seem obvious, but many of us avoid doing so. Packing in a rush is a nightmare and you will often pack copious unnecessary items. If visiting colder climes, if possible, avoid packing a hefty winter coat, these are bulky and often heavier than alternatives. Instead invest in some thermals, they are compact and just as effective once worm with layers of your normal clothes. Shoes are one of the bulkiest clothing items you will pack. Ask yourself how many pairs your realisticly need to take. Shoes such as espadrilles and flip flops take up little space, and weigh very little sell a large range of these. Always pack your shoes first, then the next bulkiest items will be your pants and sweaters. You may want roll your items up instead of folding them. If they don’t really need to be kept crease free, rolling can save you a lot of space. Is your luggage normally 20% books that you normally end up reading 20% of? Why not consider buying an e-reader. E-readers usually weigh as little as 8 ounces. And take up hardly any space. Sometimes avoiding extra baggage fees might be impossible due to whatever reasons. Set aside extra money in your budget just incase to avoid ruining your holiday or business trip. Don’t get stung. Tags: Airline, Baggage, Clothing, Luggage Express, Shopping, Suitcase, travel. Bookmark the permalink.